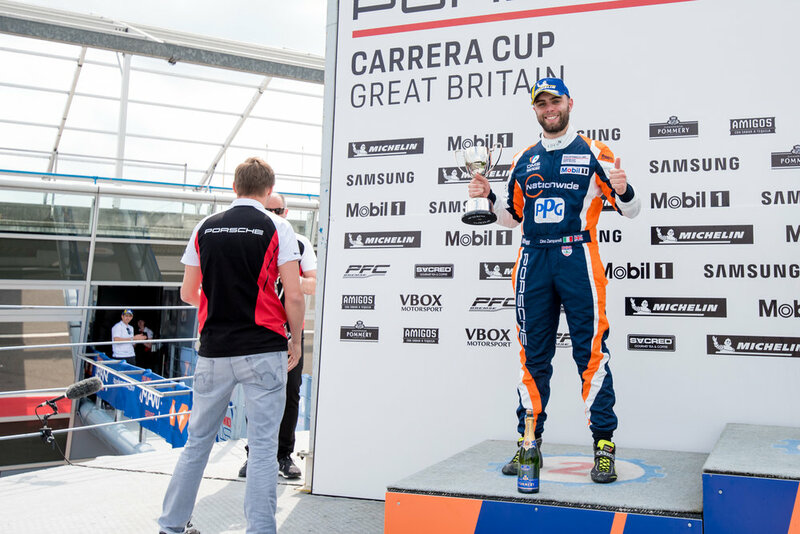 Dino Zamparelli became the first double winner of the 2018 Porsche Carrera Cup GB season, taking victory at the theatre of speed, Autodromo di Monza in Italy. The Bristolian then went on to maintain his 100% podium run at Monza by taking second place in race 2, having almost won from 6th place on the grid. The 25-year old qualified third on the grid behind JTR team-mates Dan Harper and Lewis Plato. When the lights went out for race one, Dino launched the car off the line to take second place as Harper dropped back. Entering the low speed first chicane Harper would lock up, losing control of the car and sending it careening into Plato. With Dino positioning his car on the far left of the track he was able to pick his way through the carnage to take the lead. The Safety Car was deployed soon after to recover the mess. Three laps later the Safety Car peeled into the pits and racing resumed. Dino set about building a lead as George Gamble and Championship rival Tio Ellinas battled. This ensured Dino was able to create a gap of five seconds. From then he managed the race to the chequered flag and win number two of the season. “It was all about the start” said Dino. “I got into second place off the line. I looked in the mirror into turn one and saw Harper outbrake himself and I knew pretty much instantly that he wasn’t going to make the corner. I kept out of trouble and got myself through the first corner melee, then it was just a controlling thing, I did five laps and the car was perfect. “I had a nice lead and cleared away from the field, then I was going to manage it, sort or 8 out of 10 driving but then I had a pressure warning on my dash. I was driving on a Sunday cruise from then on, praying I was not going to get a puncture. Thankfully it was just a just a sensor issue, but I had no idea at the time. "When you consider that, it was a good strong race, the Nationwide Crash Repairs Redline car was so nice. I had more in me, but I didn’t need to use it. The only pressure I felt was about the puncture but it held out. We picked number six for race two, but we’ll have a strong start, keep ourselves out of trouble and see what happens. I’m looking forward to it, it’s shaping up to be a good championship battle." Race two took place on Sunday in sunny conditions, and with Zamparelli starting in his reverse grid 6th place, he was eager to make up ground. The Nationwide Accident Repair Services-backed car got a good start off the line, but the Safety Car was deployed almost instantly as contact further back resulted in two cars being abandoned at the side of the road. When the race eventually got up and running Dino was on it. He followed title rival Tio Ellinas past pole sitter Esmee Hawkey before they set about trying to pass second place runner Seb Perez. Entering the famous Parabolica final corner Ellinas snatched a brake allowing Dino to send his nose up the inside and take third place. He then worked his way past Perez and almost immediately was on the tail of race leader George Gamble, having quickly reeled him in. With only a few laps remaining Dino tried valiantly to find a gap to overtake but, deciding discretion is the better part of valour, he settled for second place. “From sixth to second, we’ll take that all day” said Dino. “I haven’t been off the podium yet which is a record I intend to keep up this year, especially with the reverse grid. Yesterday was a nice win and today was second place but I was so close to the win. We were fast around here and took two fastest laps but sometimes you can’t force it. I made some really decisive moves to get up to second place, but this championship is not about being gung-ho. You have to be clever and take what you can when you can. My moves on Ellinas and Perez were really pleasing, and we just want to keep on taking the race one wins.